Huh? Um, when did "about two halves" make a whole? That doesn't make sense! 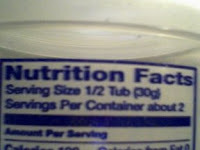 On top of that, the "serving size" (1/2 tub, remember?) is listed as "30g" - but the net weight of the container is 57g (see picture to the right; click on it to enlarge if you can't see it). What? 30g is 1/2 of 57g? 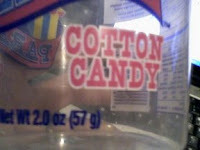 Seems they've forgotten basic math in Chicago (the place from whence the cotton candy originated). Ow... I just tried to move. Spent the afternoon working in the back yard (affectionately known as our weed garden, although it sometimes resembles an unkept plain or jungle, like it did before we attacked it this afternoon). Think I overdid it (well, probably not that; it's probably my overly-sedentary lifestyle causing any physical exertion to quickly become "overdoing it"). At least the weeds (and that slight bit of grass back there) are cut. What to put on a hot dog.